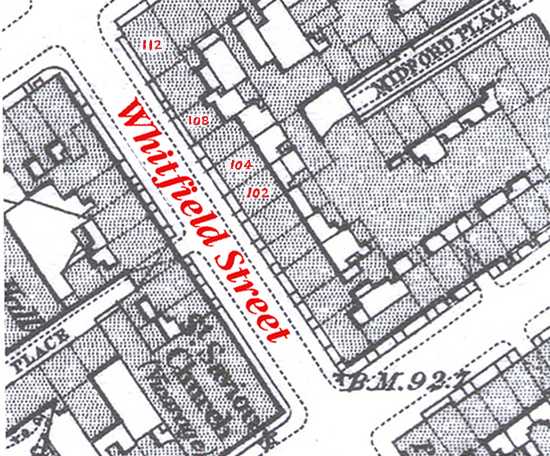 28th June 1868 saw one of the last recorded events at 102 Whitfield Street (formerly 5 Princes Street). Following the birth of George and Christiana's daughter in October 1867, his uncle and aunt Henry and Jessie Cole's second child Walter Edmund Cole was born on the 28th June 1868. The household in 1868 consisted of Henry Cole and his wife Jessie, their sons Harry and Walter Cole and Jessie's unmarried sister Margaret Aitchison. George Musgrove and his cousin Christiana and their daughter Chrissie also shared the house which had been in constant home of the Aitchison family since the 1820's (nearly fifty years).